Is education a bad thing? 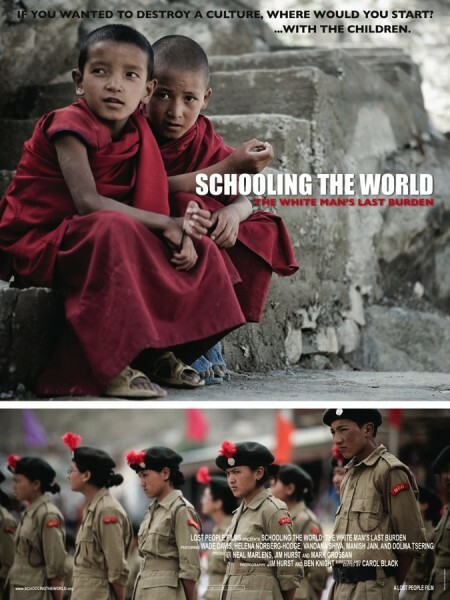 I just watched an amazing film, “Schooling the World“, which basically says that school education isn’t an answer to problems of poverty or “development” (whatever this is) but actually is the major problem. Modern school education would disconnect children from sustainable livelihoods and pull them with a false promise of progress and western style careers into misery and isolation. It’s purpose would be to dominate, homogenise culture and people and to serve the interests of a global economy. Lot’s of things to think about in this film. Is education a bad thing? How can we get back to a system that values learning in all its form over conformist curricula? Shall we send “every child to school” (as claims the Education For All initiative by the UN, strongly criticised in the film) – no matter what are the consequences? What do you think?